SOC made and enjoyed this drink at CH’s recent President’s Day Party, and I just had it tonight at a Sōsh open bar event and thought it was the best drink there (as did Superman and my brother from another mother), compared to such drinks as an Old Fashioned, Bellini and Manhattan. 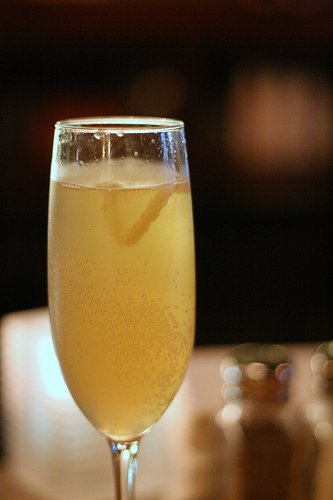 The French 75 is basically gin, sugar and lemon juice, topped off with some champagne or sparkling wine. It sounds simple enough, but as with all drinks, the art is in the proportions. Combine the first three ingredients in a cocktail shaker filled with ice, and mix well. Pour the contents of the shaker, through a strainer – into a champagne glass to not quite halfway and then fill the rest of the glass with champagne. If desired, add a twist of lemon as garnish. This entry was posted in Drinks, Recipes and tagged Booze, Champagne, French 75, Gin, Sparkling Wine. Bookmark the permalink.